Looking forward to reading and reviewing. 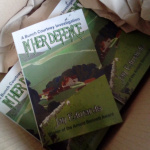 There is nothing quite so exciting as taking delivery of that first box of new books so there was much squeeeing in progress when the first batch of In Her Defence : Bunch Courtney Investigates 2 landed here at the weekend. Here it is, all its glory, ready and waiting for the launch on 4th April.